If you’re interested in the newest vehicles on the market, then stop by Island Mazda in Staten Island, NY and check out the 2018 Mazda3 Sport. Exhilaration has always run in the Mazda3 family. And the 2018 Mazda3 continues this legacy. The Mazda3’s already excellent performance and handling amplify the exhilaration with a precisely tuned 4-wheel independent suspension system. Plus, it comes with your choice of manual or automatic transmissions powered by spirited 2.0-liter or 2.5-liter SKYACTIV®-G gasoline engines, with the 2.5-liter offering 184 horsepower and 185 lb-ft of torque. Every detail of the interior was designed to make driving better. From the instrument panel to the gear selector, everything was placed with intention and care to make your every move more intuitive. Why? To let you focus on what matters most: driving. The Mazda3’s sport seats are contoured to mold perfectly to the body, giving you and your passengers a more comfortable and connected ride, no matter how long the commute. The high-end sports seats—available in cloth, leatherette or dual-stitched leather—are as carefully crafted as they are beautiful. By making the seat perforations moderately large and the distances between them small, our engineers created upholstery that’s not only soft and breathable but also absorbs road noise for an enhanced audio listening environment. When Mazda set out to design the Mazda3 cabin, they did it with the driver in mind – each step of the way. We considered every detail that could make the driving experience better, from the seats, center console, full-color Active Driving Display, and instrument panel, down to the door pockets and handles. The goal was to create a more sophisticated, intuitive interior that revolves around the driver. 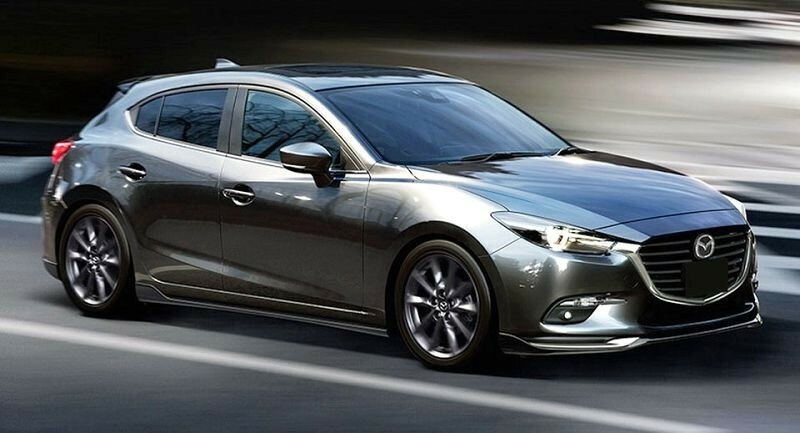 The exterior of the 2018 Mazda3 4-Door is the true epitome of KODO design. Its sleek, sporty contours tell you everything about how it drives—without ever getting behind the wheel. And available features like 18” alloys, LED headlights and rear decklid spoiler elevate the 2018 Mazda3 4-Door’s styling to another level. Why wouldn’t you want to contact Island Mazda in Staten Island, NY to experience the 2018 Mazda3 Sport.